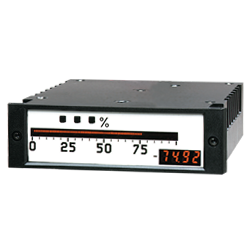 The BB101P enclosure is form-factor compatible with standard, 6-inch edgewise switchboard instruments and is a direct replacement for the GE/Yokogawa 180, Sigma Model 1151/1251, Westinghouse/Weschler VX252, and the Modutech and Crompton 6-inch meters. This simplifies retrofit into existing systems without panel modifications. A white background scaleplate is available (black is standard). For control applications, the optional set point/relay module provides on/off and differential gap control and annunciation via three set points. The optional digital display reads to 10 percent over- and underrange. An optional temperature measurement module makes the instrument a direct-reading indicator for E, J, K, and T thermocouples, or 100-ohm RTD, and an optional retransmission module simplifies distribution of the temperature parameter throughout the system.